A few moments later. KAYA is setting down to business, as SABRE watches, mildly curious – her skills with the Art are minor compared to someone like Kaya. KAYA is setting a low-lipped silver BOWL between them. 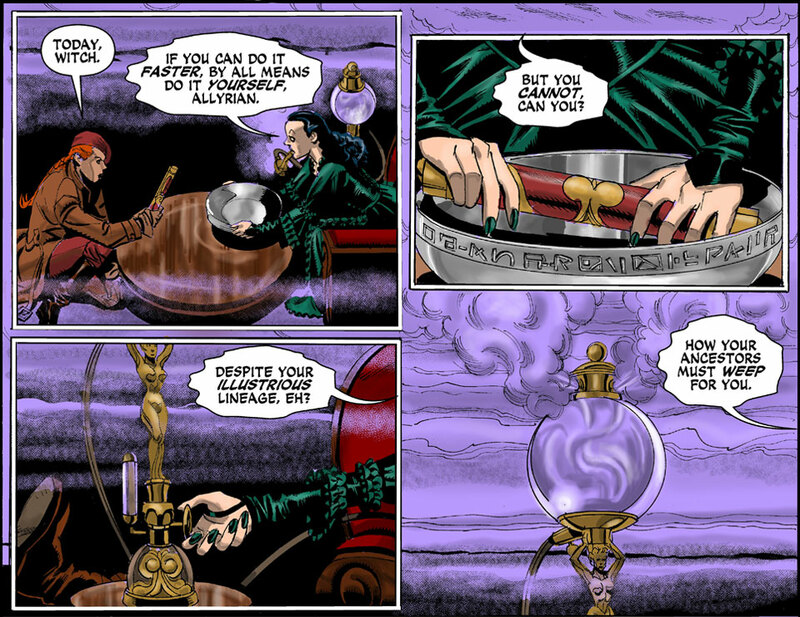 The bowl is ENGRAVED with arcane symbols, and gleams in the dim room. KAYA still has the end of the pipe in her mouth, by the way. KAYA sets the CASE in the bottom of the bowl. 3. KAYA:	But you cannot, can you? Angle, as KAYA leans slightly to the side, feeling her way along the PIPE APPARATUS beside her, hands reaching for the GLOBE. 4. KAYA:	Despite your illustrious lineage, eh? Smaller. KAYA’S HANDS – she’s opened the GLOBE, and manifest Aether is escaping, billowing up and out, eager to return to its origins. 5. KAYA:	How your ancestors must weep for you. blind or not, seneca’s probably ready to clock this … witch. I’ve read this page at least 3 times before now, but this is the first time I noticed the boot in panel three.